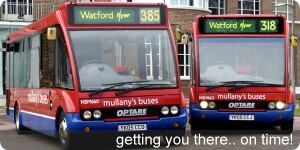 Mullany’s Buses is a family business “Putting customers first”. As the largest independent operator in South West Hertfordshire and with an extensive range of coaches, they were contracted to operate a dedicated shuttle bus service on behalf of a local tourist attraction in early 2012. “This was very much not a regular bus service” said Matthew Keyte, Commercial Manager at Mullany’s Buses “with a large proportion of visitors travelling from overseas and being seen as the face of our client we felt that our shuttle bus drivers would benefit from a training session to enhance their communication skills; we wanted to ensure the highest standard of service with our passengers”. Matthew continued “our priority is simply to put our customers first and that’s very much the attitude we found at Partners With You. After a short conversation with Sally (of Partners With You) she had a firm grip of our needs and it was agreed that the key drivers would attend their half day “Voice and Engagement” skills workshop. We were keen to keep the training short to fit between our school bus commitments so the fact that Partners With You could run the training to fit in with us was a real bonus”. Lasting for just half a day (which some drivers felt wasn’t quite long enough), the course was aimed at building confidence when speaking to visitors so that information about the attraction could be passed on in an informative and friendly manner, difficult situations could be avoided and the drivers could practice some of the techniques in the safety of the training room.